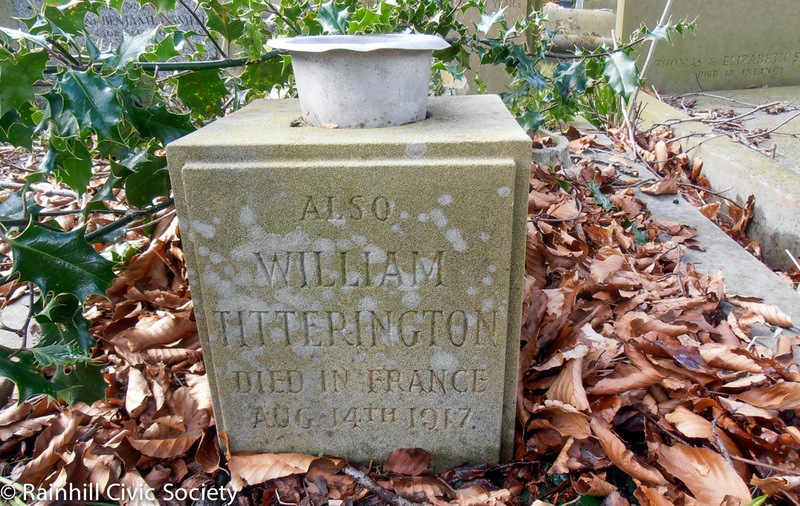 William Titterington was born in Prestwich, Manchester in 1881, the son of James and Ann of 56 Chatham Street. The father James was a wheelwright. William had an older brother John who was born in 1872 at Ardwick, Manchester. It appears by 1883, the family had moved to Rainhill as the parish register of St. Ann's recorded the baptisms of Mary Ann on June 8th 1883 and James on 21st August 1884 (James died the same year). In the census of 1901, William was recorded as a glass polisher, single, aged 20, living with his brother John and family at 62 Grant Street, St. Helens. 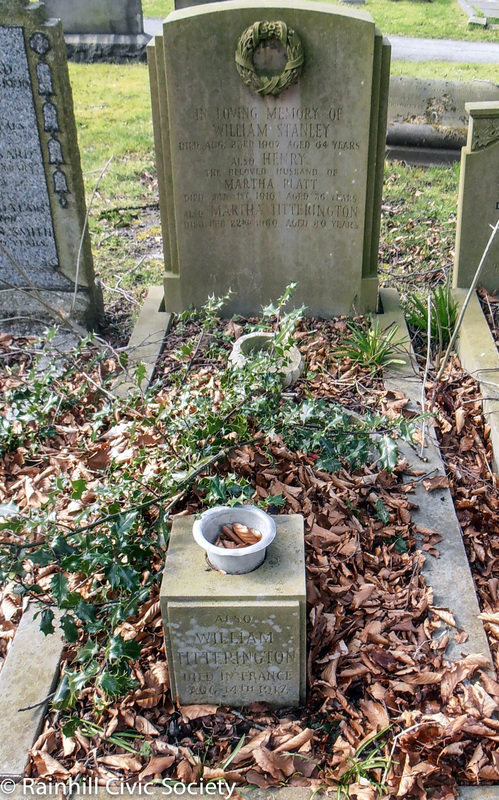 In the same year, the death of their father James was recorded at Prestwich. By the 1911 census, William was shown to be a coal miner and lodging at the home of Martha Platt, aged 32, widow, born in St. Helens, who had eight children aged between 1 and 13 years old. They all resided at Shuttleworth Cottage in Rainhill. In 1912, William and Martha were married in the Prescot Registration District (exact location unknown). Although the year is not recorded, William enlisted in St. Helens and joined the 2nd/5th Battalion Prince of Wales’s Volunteers (South Lancashire Regiment). The Battalion was raised in September 1914 at St Helens and served in the 57th Division, training at Ashford in 1915, Aldershot in 1916 and Blackdown from October 1916. The Battalion went to France on 20th February 1917. The Imperial War Graves Commission records show William was the son of James and Ann Titterington of 24 Springfield Road, Thatto Heath; and the husband of Martha Titterington of 128 Elephant Lane, Thatto Heath, St. Helens, Lancs. Martha died on 22nd February 1960 aged 80 and is buried in St. Ann's Churchyard. At a special ceremony at the Warrington Road Cenotaph on Sunday 3rd July 2016, Rainhill village dedicated a new plaque bearing the names of 17 men with Rainhill connections who perished during WW1. Rainhill Parish Council funded the plaque and organised the ceremony with Rainhill Civic Society, our local Churches and the Royal British Legion. The name of William Titterington was proposed by his grand-daughter's husband Mr. Frank Davies of Rainhill who stated "I am fairly certain that William’s name is not on the war memorial and it would be great news for all his grandchildren (some live in Australia – others in Ireland and in Cumbria) to know that he is to be honoured in this way". William's history was researched by Rainhill Civic Society for inclusion in our Fallen Soldiers section. William qualified for the British War Medal and the Victory Medal.